Object type: Storefront that was once Jonathan Wild's Lost Property Office. Location: From Gerald Howson, Thief-Taker General, Jonathan Wild, 86. Wild was an interesting character. Looked at from one point of view, he was an icon of the new moment, an upwardly mobile entrepreneur who sought to monopolize an emerging market. Born in Wolverhampton sometime around 1680, he made his way to London as an apprentice buckle-maker. But London offered a range of possibilities for a young man on the make. 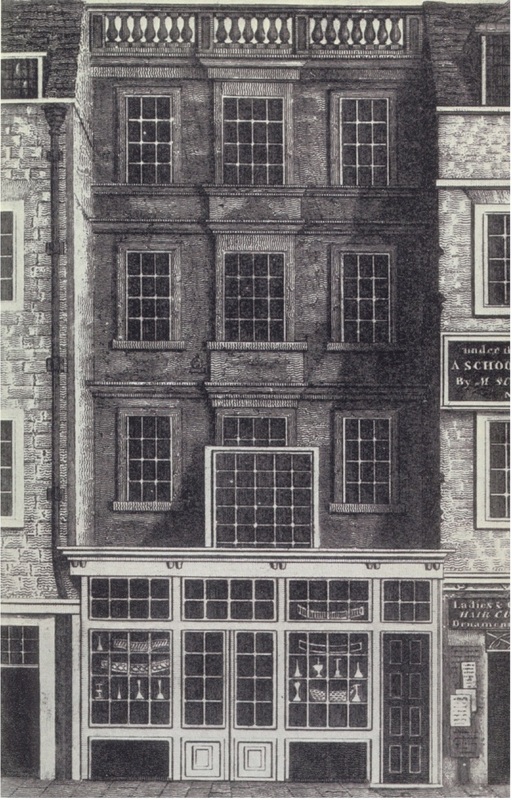 It was a busy, rapidly changing place, the center of an expanding empire, and Londoners were becoming comfortable as the owners of personal property, especially luxury objects. It is arguably here, in London and other, similar metropolitan centers, that the modern way of thinking about ourselves as owners began. As we own objects, so we own ideas, rights, time, labor, and other abstract concepts—a general set of developments now grouped together as “possessive individualism” (see Exhibit 9). It was exactly this tendency, our tendency to think of ourselves, literally and metaphorically, through the objects that we owned, from which Wild sought to profit. For thinking of ourselves as owners naturally leaves us vulnerable to our dispossession, a precarity papered over by the promises that a place like the LPO could deliver. Wild as "Thief-Taker General," the public front to a private business. NPG d8021. At the height of his fame, Wild was London's most powerful law-man: a "thief-catcher" and an expert in reuniting people with lost goods. But there is a twist. Wild was all along working the other half of the equation, for even while he was organizing the restoration of stolen objects, he was coordinating the theft of the very things he invented the Lost Property Office to return. He was the head of a criminal underworld, for which the Lost Property Office was the quasi-legitimate public front. Actually, the relationship is more grisly than even this quick sketch can suggest, for the lives and fates of people were at stake. Wild invented himself as something like London’s chief of police, its “Thief-Taker General,” at the very time that he was organizing his criminal “Corporation.” So, on the one hand, he was constantly expanding his own network of thieves and highwaymen, even while, on the other, he was “catching” them (and turning them over to the hangman) for a sizeable fee. These are the outlines of Wild’s dangerous game, and the LPO was its headquarters. Lost on Friday Evening 19th March last, out of a Compting House in Derham Court in Great Trinity Lane, near Bread Street, a Wast Book and a Day Book. . . . Whoever will bring them to Mr. Jonathan Wild over-against Cripplegate-Church, shall have a Guinea Reward and no Questions asked. These are the basic contours—though the details were more complicated than this brief sketch can suggest. The important thing for the purposes of this discussion is that Wild’s office was used for the storage and return of lost things—both the site where they were temporarily stashed, and the place where they were returned. Someone visiting Jonathan Wild would be ushered into a plain, unfurnished room, where (in the words of author D.H.) “pushing back a small panel of the Wainscot, a Hand us’d to appear with the [object] in it, and the Parties were to take them out of that Hand, and put the Money into it.” Thus was the circuit of property closed—the thing returned, for a fee, and the fiction of the possessive self once again papered over through little mechanisms like these. Because the LPO was the headquarters of Wild’s operation, it was repeatedly imagined through the same set of tropes and traditions developed elsewhere to offer metaphors of mind. Consider this anonymous engraving, entitled “Honest Jonathan in his Repository.” This engraving is shot through with irony; Wild is only “Honest” in an ironic sense. But the image otherwise captures all the essential features of the cabinet portrait, an arrangement of things meant to indicate something about the person who dwells there. Such a portrait is at once an image of a private space and (by extension) of a mind and its contents. All the basic elements are here: the space of intellectual work, the sorting mechanisms, and a recording apparatus—as the many scraps of paper, labeled “memorandum,” makes implicitly clear. There is even, displayed here, a kind of inlet or sensory and proprioceptive organ, for that blank panel above Wild’s right hand might very well be the little panel in the wainscot mentioned by D.H., the thing that makes possible the return of private property to private individuals. “Honest Jonathan in His Repository,” in other words, is the portrait of a person put together out of other people’s property. It is a portrait of dispossession. "Honest Jonathan" joins a group of similar images, including this early painting by William Hogarth (see also Exhibit 15), executed just a few years later and entitled "The Distressed Poet." Each of these is a portrait of dispossessed individualism. The very fact that this painting is recognizable as a cabinet portrait—though of an ironic type—begins to point the way to a reading. It begins to suggest the extent to which an original art object, like this one, is in fact a pastiche of ideas borrowed from other people. Put more precisely, it begins to suggest one of the ways that scholars of the eighteenth century thought of artistic creation as creative borrowing of materials belonging to the public. It is an arrangement of ordinary things—in fact, the kinds of things that might end up in Wild’s office—meant to suggest an idea. And here, the idea is an idea about poetic production, about what it means to write a poem (or paint a picture). Hogarth’s “Distressed Poet” is thought to be a depiction of an actual poet—Lewis Theobald, a piece-work writer on the low-end of the trade. But the particular identification isn’t important (though the very fact of the theft of Theobald's public image is itself part of a general set of borrowings). More important is the mode of writing that is captured, here. 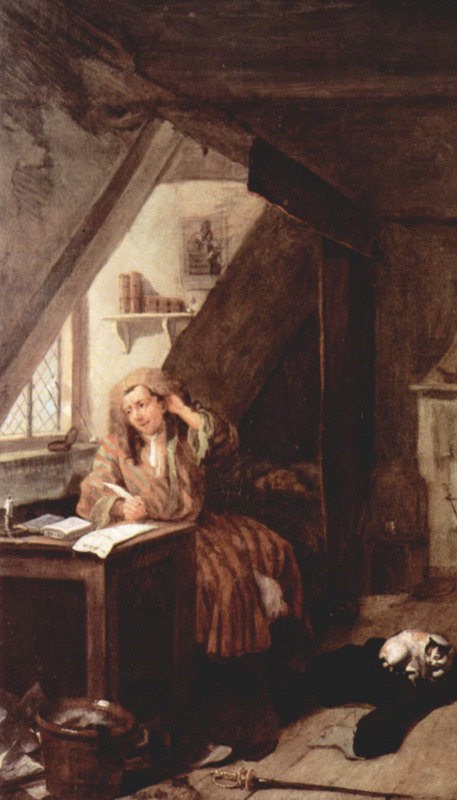 Hogarth’s poet is cobbling together a poem “On Poverty,” but the context suggests that he is borrowing his verses. The print tacked loosely to the wall just above his head alludes to Alexander Pope's Dunciad, while the copy of Bysshe’s Book of Poetry provides his rhymes. (Later editions of the image, issued as a print engraving, included a satirical print of Alexander Pope’s wranglings over copyright with Edmund Curll (see Exhibit 27.) A copy of The Grub Street Journal, a satirical pamphlet on piece-work authorship, lies on the floor. This, in other words, could very well be a poet like the poet of Thompson’s “Splendid Shilling” (Exhibit 22). Everything surrounding the poet is ironic; his poetry is in invisible quotation marks-- the work of other people that he silently quotes-- but so, too, is the litter of objects in the poet’s room. The sword is one particularly significant trinket, worn less for protection than as the sign of gentility, worn not as a weapon but an accessory, not a sword but a “sword.” It is worn ironically—but it is also owned ironically, owned “as if” it will be owned all along, when clearly everything in the room is in immanent danger of being repossessed. This is why the poet is scribbling so furiously in the first place; he is borrowing phrases about riches, in order to borrow a few signs of the riches he would like to have. He is a public person who has put himself together out of other people’s things. This is a portrait of the dispossessed, offering a figure of poetic production, much like Philips or Pilkington before him (Exhibit 22 and Exhibits 23-24). Documenting my visit to London's largest bureaucratized Lost and Found. Photo by Curator (2008). I will just end with a couple of notes. The first is this: Wild's LPO was shut down in 1725, but the institution lives on. It gave way to a series of similar operations, then a fantasy of a universal registry begun by the Fielding brothers, an office at Scotland Yard, and so on. One version of what it has become, traceable through a more-or-less direct lineage, is the LPO of Transport for London-- a proper place for all lost property. If you happen to lose anything in metropolitan London-- specifically on public transport, but also in public places like parks or on the street-- the best place to go is this little storefront operation, articulated to a vast warehouse of lost goods. Here are collected all sorts of things, objects (cellphones and umbrellas, but also jewels, books, artworks, human remains, articles of clothing, and so on) with nothing in common except that they are all "lost." Suggestively, it is on Baker Street-- just across from the site of another engine of London fiction, the location of Sherlock Holmes's detective office. (At least one of Conan Doyle's Holmes stories, "The Adventure of the Blue Carbuncle," meditates interestingly on museums and lost property.) I myself "lost" several objects in the summer of 2008: a silver-hilted umbrella, my diary and notes of my summer travels, a biography of Jonathan Wild. I got them all back-- all except for the umbrella-- for a fee, of course. Thus are our own fantasies of possession propped up by an elaborate bureaucratic mechanism. All this is by way of suggesting that the very thesis of possessive individualism involves us in something like its opposite; the belief that the mind is a collection of objects opens us up to the immanency of their dispossession. Viewed this way, ownership is only a temporary status, a pause of an object on its own trajectory. The doctrine of possessive individualism is, in other words, built on the shifting sands of things we only beg, borrow, or temporary cull from the ebb and flow of the world. This was a lesson that Jonathan Wild himself would learn the hard way—when he was forced to come to a realization about the precarity of his ownership of his own body. I will say no more on this matter here, however. The fate of Wild’s Office, and of something as intimately owned as his own skeleton, is the subject of a different exhibit (Exhibit 27, the last in the museum).